Are you a PR practitioner who is passionate about education? As an industry mentor for Outside the Square you’ll coach a team of students as they plan and implement a pro-bono PR project. Your professional skills are invaluable to our students – and the experience can be just as rewarding for mentors. 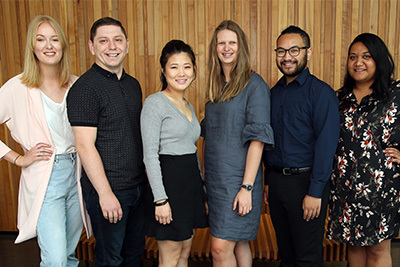 Outside the Square (OTS) is New Zealand’s only student-based PR consultancy giving pro-bono help to not-for-profit organisations. It’s an effective hot-house teaching laboratory preparing bright, young practitioners for the challenges of working in the communications industry. If you’re a not-for-profit organisation (or a consultant with a pro-bono client) with a challenge you need to tackle, OTS may be able to help. Students will work on your organisation’s project as a team. They are matched with an experienced industry mentor and closely supervised by senior academic AUT staff. The team will create and implement a strategic communication plan, designing an event or activity and its supporting communications. Our students take part in OTS as a requirement for their PR degree and must submit assignments during their project. As an OTS client, you have some obligations to make sure that students can meet the requirements of their degree. This include things like briefing the team, setting and attending meetings with them, and being available for sign-off as required. At the end of the project, you need to complete an evaluation form for each student. Get in touch with us to discuss how we can help you, or to find out more about OTS.